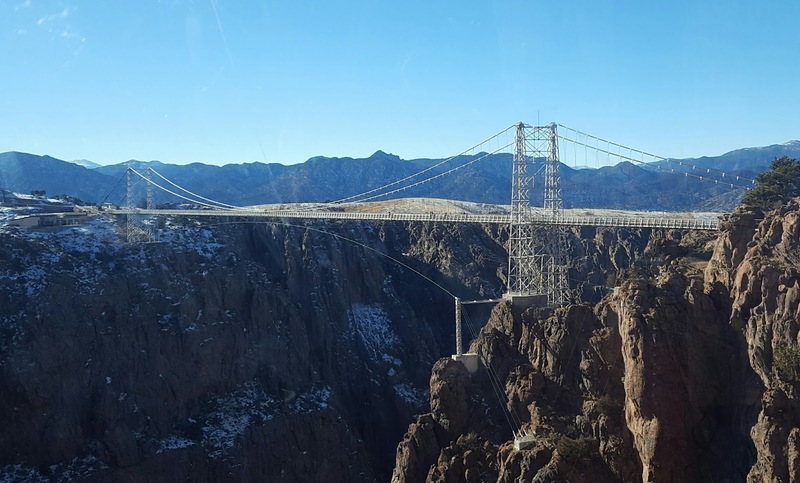 Did you ever walk against the wind on a suspension bridge at a height of 956 ft above a river? 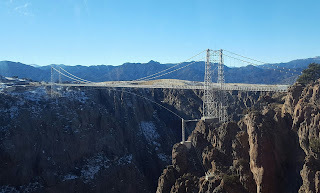 As luck would have it, the day we decided to visit this one of the world's highest suspension bridges, the wind was blowing at around 38 miles per hour. The natural views around the bridge were breathtaking and the frozen Arkansas river below was amazing too. But due to strong winds, it was very difficult to cross the bridge with kids, that too with one kid on a pram. 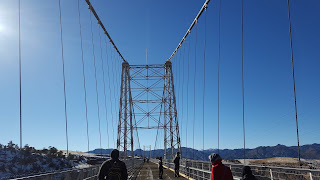 The last part of the bridge has more ferocious winds freezing our hands even with gloves. Thus, the walk on the bridge was tough on that day. 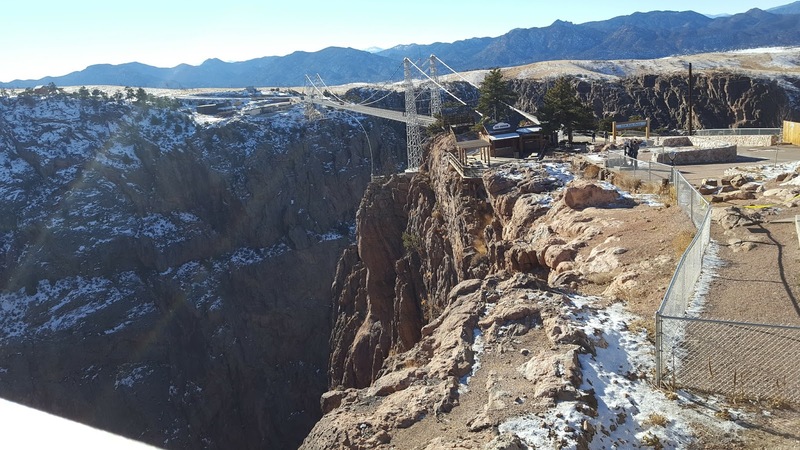 The other side of the bridge has a plaza theater, which shows the history of the park, how the bridge was built etc., and there is also an exhibition of historic artifacts and photos about the Royal gorge railroad. Fortunately, by the time we completed the show, the wind reduced below 30 mph and they started the Gandola rides. On the way to Gandola ride, there is a children's play area with merry-go-around. The admission to the park, which includes Gandola ride is around $20 for adults and $15 for kids above 4 years of age. There are other adventure rides available for an extra charge like Royal Rush skycoaster and cloud scraper zipline. The skycoaster looked scary but entertaining and zipline is more comfortable than other ziplines that I saw. 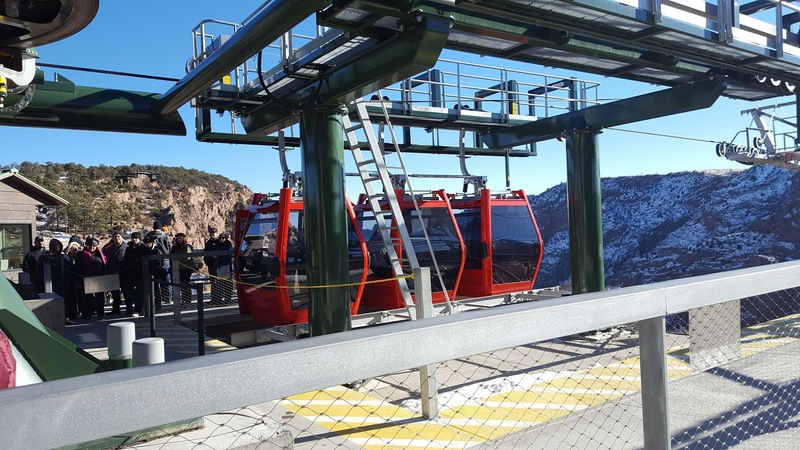 The Gandola ride is great with awesome views of canyon and the majestic Arkansas river at the depth of 1000ft below. 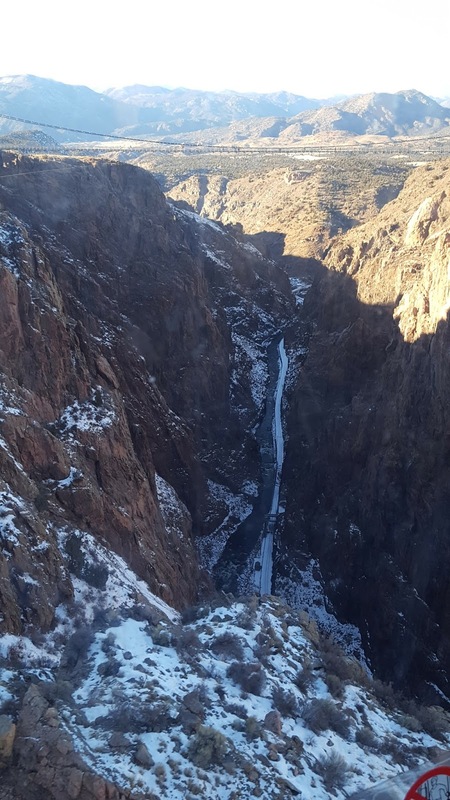 We can also watch the Royal gorge train route below along the river. 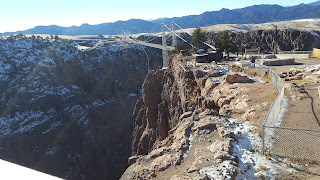 Here are some views of the canyon and the bridge from the Gandola. There is a water clock that welcomes us next to the visitor center while we are entering the bridge. This extraordinary water clock is only one of the three in the world which shows the current season, year, date and time. 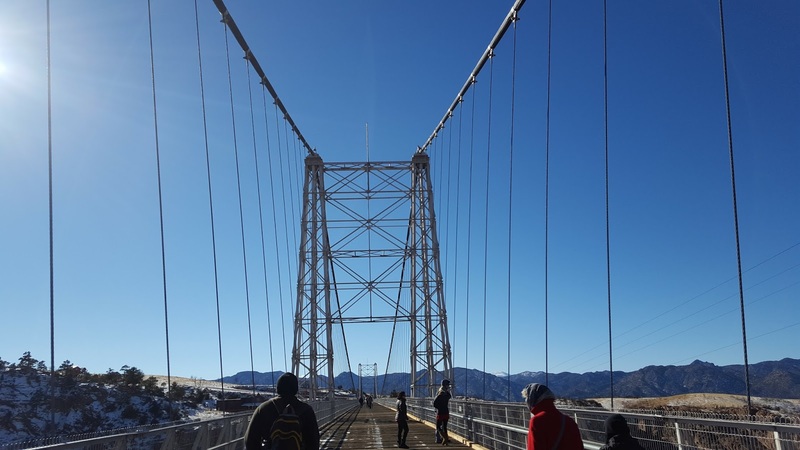 The bridge was constructed in 1929, but it was completely destroyed in 2013 due to fire and what we say is rebuilt recently. Though a little expensive, this bridge is a must watch. Such a picturesque place. 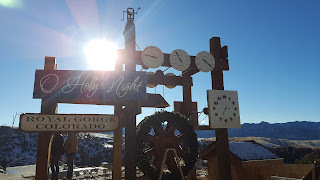 I liked the frozen Arkansas river and the water clock seems fascinating! The ride seems fascinating and adventerous! Wow, that sounds like an amazing, albeit freezing, experience! Brave of you to do it, with kids. I am sure it was worth it.